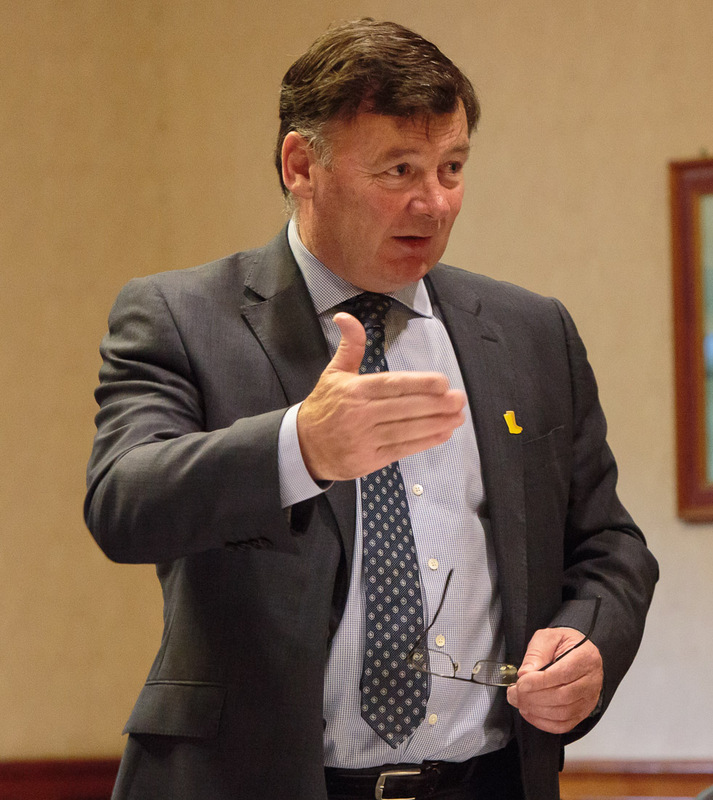 Allan Bowie, President of NFU Scotland, was the speaker at the Club’s October Breakfast meeting. He farms in North-East Fife and Clackmannanshire with his wife Christine and son Callum, majoring on growing cereals. The area farmed extends to about 850 acres on contract farming agreements. Allan spoke to Club members and guests on the impact of Brexit on the rural economy and other issues affecting local farmers. He is “pretty upbeat” about Brexit and believes we can do better outside the EU if we address non-EU-related key issues such as food security and explaining to British consumers that UK farmers can supply more than the 61% of food currently being sold in the UK but consumers need to ask for more homegrown food from the supermarkets. He fully expects existing EU regulations to be retained by the UK until at least 2020. We need to address where agriculture will get the willing workforce required for field work and processing if controls on migrant workers, including those who’ve been settled here for many years, get stricter – because British people don’t want to do it, even though it pays more than the National Minimum Wage. If we don’t, the result could be more food being imported unnecessarily. The requirement for non-UK workers extends beyond fields, a large percentage of the workers in the centralised retail distribution network are foreign nationals. We need to address the issues of trade tariffs and quotas, but this should be seen as an opportunity as well as a threat – if whisky exporters, for example, can reduce the 180% tariff for whisky imports to India by even 30% they could increase sales significantly. There are opportunities opening up for our farmers from Brexit – for example if feedstock for animals currently bought in from an EU country becomes more expensive, it opens up a potential market for British farmers to supply it instead. We need to invest in promoting British food more, putting the red tractor symbol and Saltire on packs has an effect but more needs to be done especially if a non-UK alternative is priced cheaper. Something like an app to allow customers to see which dairy products are the most ‘farmer-friendly’ would help farmers benefit more from initiatives to allow all consumers to make informed choices. Consumers need to be better informed so they can understand the importance of quality food with a known provenance being grown in UK and demand this from supermarkets – not just cheap food, as the horsemeat in burgers crisis had shown. If something like that is being sold very cheaply we need to ask why. The NHS could benefit greatly from more healthy food being eaten that has been grown here in the UK. There is a huge potential market out there with benefits to all. Food waste created by perfectionist specifications on size and appearance of produce needs to be reduced, alongside more education on how people cook food so the health benefits can be fully enjoyed. Farming needs to do more at explaining what it’s doing on issues such as animal welfare and acting as a steward of the countryside.